You can drive by a place 1,000 times and be unaware of its history. Such was the case for a small country store on Highway 378 in Edgefield County. Over the years I’ve passed the little store you see with this column 1,000 times and not once did I stop. That changed Sunday, October 13. I did pass it but I turned around, curious to see what the price of gas was on the old rusty pump, leaning like an old man with a cane. 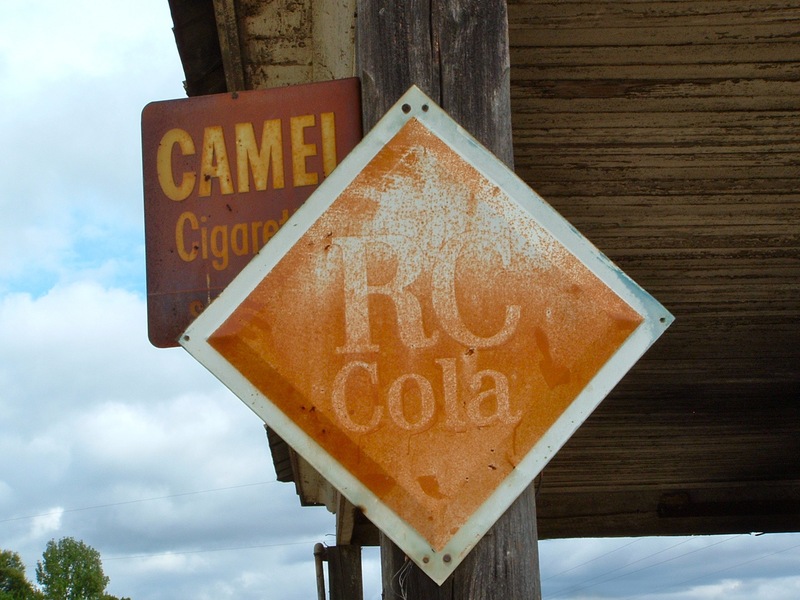 I got out with my camera and the classic RC Cola sign immediately distracted me. Behind it was another vintage sign advertising Camel Cigarettes. American Pickers would like this place I thought. I moved closer to get the shot you see here. That’s when a man slipped up behind me. “People try to buy them all the time,” he said. “It’s a wonder someone hasn’t stolen them,” I replied. And then the most incredible story unfolded, a story made for TV, a story that goes back to 1941. The little store at the intersection of Highway 378 and Highway 430, a road that leads to Edgefield, a road known as Meeting Street, holds deep, dark secrets. In 1941 Roads were unpaved and in many areas electrification had yet to arrive. Men still farmed with mules. Times were tough and people were rough. Back then it must have been an upsetting thing to lose say, a calf. Yes to lose a calf was to lose an investment. When a mule wandered from one Edgefield County farm into the pasture of an adjacent farm it kicked a calf, killing it. Someone had to pay for it. That someone was the granddad of the fellow standing beside me. “Yep, my granddad was shot in the back for $500. Right in there,” he said pointing at the store’s old wooden siding. Murderpedia, an online encyclopedia devoted to those who kill others documents this tale of dead livestock and lives gone wrong. It quotes a report that appeared in EdgefieldDaily.com, which I provide here as the facts have been vetted. “The story began in September of 1940 when Davis Timmerman’s mule got into Wallace Logue’s field and the mule kicked and killed Logue’s calf. Logue demanded that Timmerman pay him $20 for the calf and Timmerman agreed. Logue later went to Timmerman’s rural store and decided he wanted $40 in restitution instead of $20 and Timmerman refused to pay. Logue became infuriated, grabbed an ax handle, and began beating Timmerman. Timmerman pulled a gun he kept hidden in a drawer, shot twice, and killed Logue. Timmerman was said to have locked the body in store and, despite being seriously injured, drove to Edgefield to report the shooting to then Sheriff L.H. Harling. Sheriff Harling, Coroner John Hollingsworth, and Solicitor Jeff Griffith drove back to the store. Based on their interpretation of the evidence, Timmerman was held over for trial. After the trial the jury ruled Timmerman acted in self-defense and he was acquitted. Logue’s widow, Sue, and his brother, George, didn’t agree with the jury’s verdict. They hired Joe Frank Logue, George and Wallace’s nephew, giving him $500 to find somebody to kill Timmerman. Joe Frank was an officer with the Spartanburg Police Department and he hired Clarence Bagwell to do the job. A year after Wallace died; Joe Frank and Bagwell went to Timmerman’s store. Joe Frank waited in the car while Bagwell went in and asked for a pack of cigarettes (some say it was a pack of gum). When Timmerman turned to get the item Bagwell fired five shots at point-blank range with a .38 caliber revolver, killing him instantly. Joe Frank and Bagwell returned back to Spartanburg and carried on as if nothing happened. Unfortunately for the pair, Bagwell was a heavy drinker and during one of his binges bragged to a young woman that he had made $500 for killing a man. The woman went to police. When Bagwell was questioned, he learned that he had been seen at Timmerman’s store on the day of the murder. Other reports say he was spotted casing the store prior to the murder as well. Either way, feeling trapped, Bagwell confessed and fingered Joe Frank as well. It turned out Joe Frank wasn’t a dutiful nephew after all. He admitted hiring Bagwell, and also told the authorities that the money had come from his aunt and uncle, Sue and George Logue. On Sunday, Nov. 16, 1941, newly elected Sheriff Wad Allen and Deputy W.L. “Doc” Clark picked up the warrants from magistrate A.L. Kemp and headed for Sue Logue’s home. But someone had warned George Logue that the law was on the way. Logue and a sharecropper, Fred Dorn, ambushed the two officers. Sheriff Allen died after being shot in the head and Deputy Clark was shot in the stomach and arm. Clark was able to wound both men before staggering from the house and making his way to Highway 378 where he was picked up by a passing motorist. Gov. R.M Jeffries later ordered state patrolmen and deputies from Saluda County to arrest Logue and Dorn. With dozens of officers surrounding the house, and officials wanting to avert further bloodshed, they appealed to then local Circuit Court Judge Strom Thurmond, a Logue family friend, to try to reason with the Logues. Thurmond walked alone across the yard and into the house. The Logues followed his advice and surrendered a short time later. Two days later, Deputy Clark died. Logue’s friend, Fred Dorn, died the day before. Four months later, George, Sue, and Bagwell were tried for Timmerman’s murder. The three-day trial was held in Lexington County with Solicitor Griffith serving as prosecutor. The jury took only two hours to convict the trio. Sue Logue was the first and only woman to die in the electric chair in South Carolina. Less than an hour after Sue was executed, George and Bagwell took their place in the electric chair. Joe Frank Logue received the death penalty for his participation in the killing and his execution date was set for Jan. 23, 1944. He ate his last meal and was prepped for the electric chair. Shortly before midnight, Gov. Olin D. Johnston visited Joe Frank and as a result of that visit, Johnston commuted Joe Frank Logue’s sentence to life. Within 10 years, Joe Frank Logue was given a job with SLED as a bloodhound handler and trainer. In 1960, 37 of the state’s 40 sheriffs supported Joe Frank’s bid for parole. T. Felder Dorn wrote a book about this tale of revenge, of murder for hire, The Guns Of Meeting Street. Bound to be a riveting read. All those times I passed the store I had no idea such a story of mule-mad-mayhem had taken place there. I’ll never pass that way again that I don’t think of the murders and Sue Logue who was quite concerned about her appearance. On the evening before her execution she cried softly as her long black hair was shaven off. Oh! I almost forgot. 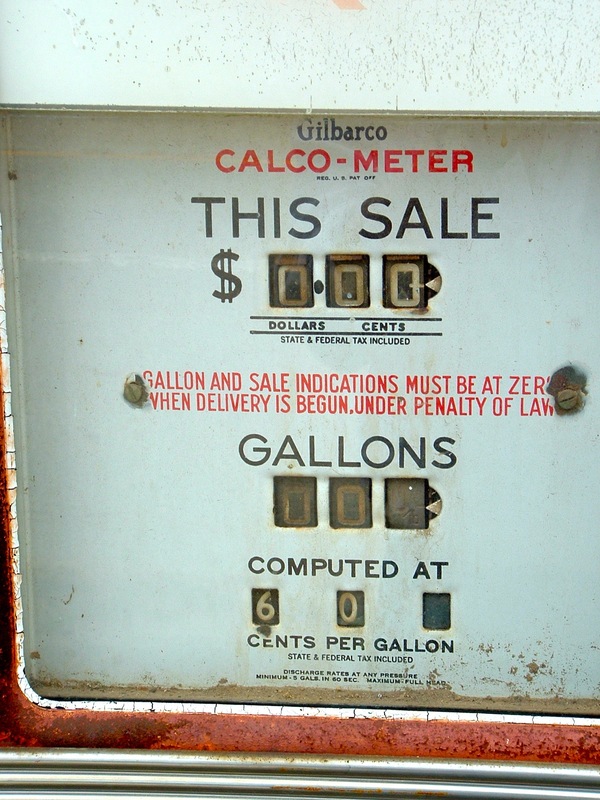 The price of gas on the old pump was sixty cents a gallon. That pump must have last dispensed gas circa 1974, about the time I first passed this store where a mule’s kick set a series of tragedies in motion. Great story, and a great read. I had heard the bit about Strom having purportedly had “relations” with a woman on the way to her execution, but had no idea of the details behind her death sentence. And I can see why the fellow you met when you stopped is protective of the store. What a story…only a movie made for t.v. could never give the real story justice! 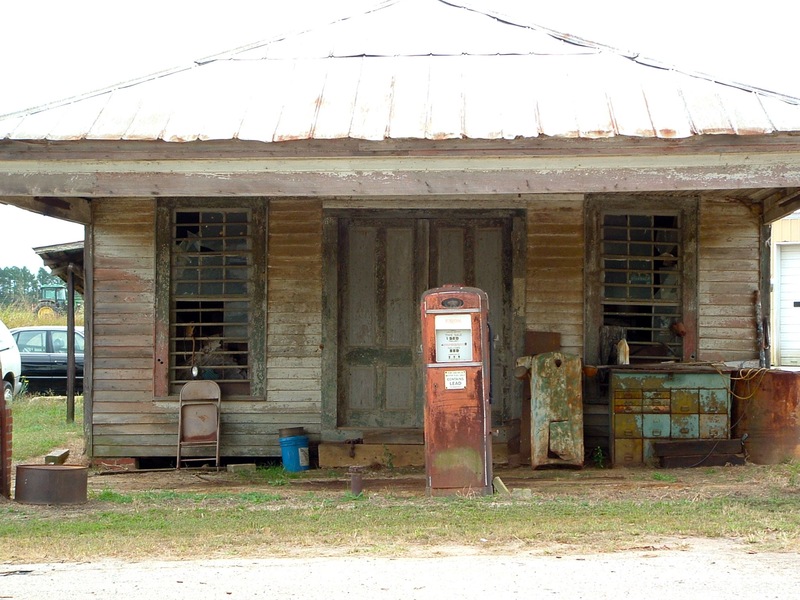 When cycling out in that neck of the woods, my husband and I pass an old gas station, with a similar old pump out front, on Highway 391 on the way to Leesville, SC. I’ve often wondered about the stories behind that location. I might make sure not to look too hard the next time we pedal past it. Great story – thanks for sharing it! Great story, Tom. SC should erect a “historical memorial” on that site, with an internet story link. …interesting account…one tidbit to add: My father (1896-1971) grew up with his childhood friend Olin D. Johnson. They were kids swimming behind Barker’s Creek Church (near Honea Path, Anderson County, SC) …Johnson was drowning, my father, William Everett Trussell saved his life. Dad’s dear friend, Olin D. Johnson never forgot who saved his life, and he kept in touch with my WWI father until Johnson died. One of his daughters called to check on Dad after Johnson passed. IF Dad had not saved his life, Joe Frank Logan’s life would NOT have been spared, as there would have not been a coincidental meeting with Governor Johnson who pardoned him…Oh what a twist of good luck it was for Joe Frank. I’ve often driven my Dad to Johnson’s grave & listened to stories he told me of their childhood. What a story, Tom! The stories that lurk in the most unsuspecting places are often the most interesting. This one even has a famous politician involved. I’ve often wondered what makes people do murder, and this case is no exception. I understand the loss of an investment, but to kill someone over it? No. Too bad the book was already written for this one. It has everything to be a great page turner, even the above comment from Patricia Trussell-Mann for yet another twist! Shannon, you just can’t make up stories like this one. And you are right about that comment. When I drive by that store, which is often, I see the events unfolding before my eyes. Oh if you only knew! There are so many made for TV and made for the big screen stories in Edgefield, my family is from there and I do research on the area. I began researching alone and now I have connected to several families who work together. We have found an African American being found not guilty in 1889, connections to several famous and infamous people and an African American man who fathered 45 children with only two women. He was born in 1769 and died in 1884 making him to die at 115 years old. We should meet and talk about all this. Just wanted to point out – Sue Logue was the first woman executed in South Carolina’s electric chair, but not the only one! Another woman named Rose Marie Stinnette was executed in the electric chair four years later, in January 1947, for poisoning her husband. You might want to make a minor correction to the article. Other than that, this is a fascinating story!